This entry was posted in desire, discernment, flow, truth on 1 March 2019 by Martina. 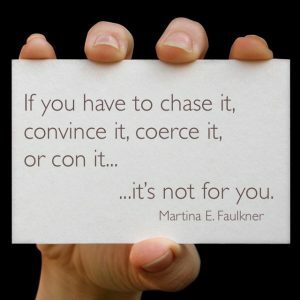 If you have to chase, it, convince it, coerce it, or con it… it’s not for you. Why are you looking for an exception? Is it because you don’t want it to be true? Or have you actually genuinely tested it and know it not to be true for you? If you spend all your time pursuing that which isn’t for you – you will always miss the things that are yours, because you won’t be able to see them. You’ll be blinded to their existence by desire. Desire is a fickle friend, it can lead us down a path of unhappiness that we don’t notice until it’s too late. Unquestioned desire (often created and fueled by external sources) is even worse. It’s a con artist that feels like motivation and hope, but in reality is based in lack and fear. The Power of… Not Engaging? This entry was posted in alignment, awareness, chaos, choice, detach with love, discernment, empowerment, mindfulness, neutrality, possibility, power, resilience on 20 September 2016 by Martina. This has been my mantra of sorts for a while now. It’s the phrase I hear in my head (always repeated three times) when I am waffling between commenting on something in social media, or jumping into the fray of some in-person drama. Usually, I have the presence of mind to steer clear, but sometimes I make the mistake of chiming in… when chiming in is the worst decision I could have made. Hence, I created a phrase to help remind me of the importance – and power – of not engaging. Lately, interestingly, I’ve found that I’ve been teaching and sharing this powerful (non)tool more and more often. The problem I see is that people are feeling worn out emotionally, which spills over into our daily lives and diminishes our patience and tolerance for others (aka: our compassion). Choosing a path of non-engagement preserves our compassion and amplifies our energy. Let me clarify that “non-engagement” is not the same as disengagement. Disengagement implies a level of not caring, or apathy. It’s a “head-in-the-sand” mentality. Non-engagement is about witnessing. It’s about watching, learning, seeing, reading, and understanding from a neutral perspective so that your emotions (your energy) is not sucked into the mayhem and chaos, thereby depleting you or lowering your vibration. Non-engagement helps to keep you in alignment with who you are, while also allowing you to have ample amounts of energy to choose where, when, and how to engage. This is key. This means that you can direct your focus and your energy into that which you wish to fuel, and THAT is where the power lies. When you accept that you can CHOOSE where, how, and to what you wish to give your energy, life becomes infinitely more possible. It’s okay to not engage in the battles. All activism is not necessarily good activism, especially if the activists are constantly feeling depleted. This is why it’s important to know where your heart resides, and pursue that. If it’s animal protection and rescue – do that. If it’s politics – do that. If it’s the environment – do that. If it’s not activism – that’s okay too. 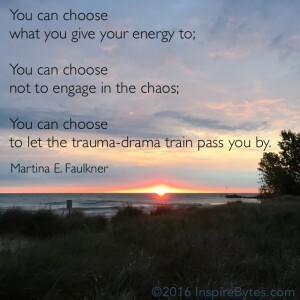 …You can choose to let the trauma-drama train pass you by. Engagement is a choice. Non-engagement is a choice, and both are acceptable. In fact, both are necessary if you wish to have the energy, compassion, and presence to engage where your heart leads. If we engage in chaos, we fuel chaos. Because, remember: Where we choose to engage, we fuel. This entry was posted in authenticity, awareness, beliefs, boundaries, change, choice, courage, discernment, empowerment, freedom, judgment, mockery, perspective, politics, rationalization, satire, slippery slope, statues, Trump, wisdom on 23 August 2016 by Martina. It’s perhaps from that non-partisan perspective that I can better see things that show up as red flags. In response to my post, I heard from friends on both sides of the fence (fiercely loyal Republicans and Democrats alike), and both agreed wholeheartedly with what I wrote, which caused me to pause and reflect on what’s truly going on, if two opposing sides can agree. So…can I just chime in for a second… Because this is funny and all, and it’s always a good joke to poke fun at someone we find insufferable, right? But… if it were the other way around, if naked Hillary statues were placed around the country, would it be as funny? Or would we be outraged? Because if it wouldn’t be funny to you, then maybe this is not actually funny. I just want to make a tiny reminder that double standards are the breeding ground for things like racism and privilege. Just something to think about from the social worker in me. Thank you. The downfall of this election will not be (I fear) who wins or loses, it will be the American people more divided than ever. No matter which candidate wins, we all lose. Spreading division is a sure fire way to create the lowest morale and systemic emotional illness, from which it will take years to recover – which then means that neither candidate will win, because they will inherit an emotionally diseased country, of their own making. PS: It’s called the UNITED states, and they/we are making it the DIVIDED states. Discussion ensued, and I started to see the pattern that initially gave me pause. Basically, the act of publicly degrading another human being feels like a violation of our core for the majority of people, regardless of party politics. Why? Because it is. It’s a simple truth actually. If we witness someone acting out negatively toward another human being, we either a) become enraged, or b) become sensitized to it, and ultimately accept more “bad” behavior. How we then choose to act is dependent upon our initial reaction. Of course, we couldn’t come up with an acceptable answer, but our awareness had been heightened by the experience and ensuing discussion, which, for me, resulted in a greater sensitivity to seeing the forest from the trees. That basically means that when I see something go from individual to systemic a HUGE red flag rises in my mind’s eye, and that’s exactly what happened last week. Back to the Trump statues. Let me be clear that I don’t agree with the divisiveness and hatred that Donald Trump has espoused this past year, so this article isn’t about defending Trump. Nor is this article about condoning Hillary, as the Democrats have historically also been responsible for divisiveness and mud-slinging. Neither party is innocent of this type of debasing behavior. This article is about defending humanity and our civilization. In one comment on the statues, it was suggested that it was “okay” to mock Trump with the statues because satire has always been a part of politics, and it’s our right. In another the mockery was justified as “deserving” because of Trump’s words over the past year. This is where I took issue. At what point does mockery become a threat to society? At what point do we stop and say, “no.” to that sort of behavior? This is where we have to guard against the slipper slope of mockery. Where I suggested the statues went too far for myriad reasons. …for me it’s not about “the high road” – it’s about focusing on the bigger picture, which is that this type of behavior fuels more of this type of behavior, and if I condone it in one, I must condone it in all. No reason justifies it. That would be like saying, a person who was abused is ok to then abuse others. It’s not. It never is. It might explain why someone has abused someone else (as it often does), but it doesn’t make it ok on any level. Not for me, at least. ….And into that very dangerous ground we tread. The minute we can start rationalizing and justifying demoralizing behavior, we are losing. As a society and as humanity. …If we start segregating people based on this thinking (they deserved it) we have reverted as a collective. Who is to be judge and jury? It’s all subjective. And the loser is always society. …it’s more than kindness – it’s civility. But for me, it’s more than that – it’s humanity and civilization. As we lose our sensitivity to unacceptable behavior – that behavior becomes the “norm” and the threshold is moved. It’s one of the most slippery slopes we have actually, and if we don’t stem the tide, it will become a tsunami. And then all of humanity, civilization, loses. We ALL lose, regardless of party allegiance. I’m in the camp that we are already losing, but not in the camp of “beyond hope” for systemic change. But it has to start somewhere, and ideally it has to be bookended – from both above and below. Those in power, and those that elected them, both have to change how it’s done. Both have to have a fierce no-tolerance policy for degradation. You see, historically (and even currently) I have always aligned with the policy of laissez-faire, or “let it do” (aka: let go). I don’t believe any one person has a right to impose their beliefs on any other person, myself included. I wish to be free to explore my beliefs, my thinking, my studying and change my mind/actions/presence accordingly. And I want the same for everyone else. Where beliefs overlap, I want those individuals to be able to form community and fellowship, celebrating the overlap and the joy in connection. This is my ideal society. Overall, I think we have been living this way in America for a long time. It’s not perfect, but it has functioned, mostly well. The reason it functioned, I think, is because the majority had adopted a civil and moral code of conduct that was unwritten, but understood. Therefore, when I see the system sliding away from that invisible moral code and crossing a threshold into transforming unacceptable behavior into the “norm,” I get concerned. Red flags rise everywhere, and it becomes time to speak up and speak out against this type of behavior. I think if you asked most citizens of this country if they believed in basic human rights, and the desire to be free to think as they choose without having their beliefs imposed upon, they would agree. Nobody wants to be scorned. Nobody wants to be shamed. Nobody wants to be mocked, ridiculed, or degraded. I doubt you would find one person willing to subject themselves to such behavior. Why then, do we do it to others? Why is it ok to mock, shame, scorn and degrade another human being, when we don’t want it for ourselves? The simple truth is: it’s not. It’s not okay, and it never will be okay – but the more we do it, see it, witness it without speaking up, the more acceptable and “okay” it becomes through progressive rationalization, or desensitization. And that’s what we witnessed last week with the statues. Yes, politics and satire have always been bedfellows to an extent, but at what point have we crossed the line from satire into degradation? At what point do we draw the line and choose to reverse the problems this type of behavior has created? I would argue that that point is now, and it’s up to all of us to simply say “no, I don’t accept that behavior,” when we see it, and then offer a different way. The important distinction is to comment on the behavior, not the person. Behavior is something that can be changed. It’s not a statement about a person (ie: “I don’t accept that person,” which is problematic for myriad reasons), it’s a statement about something a person has done. That can then lead to discussion, relation, and connection – which ultimately leads to positive change for all. This entry was posted in choice, discernment, empowerment, pause, relationships, Uncategorized on 12 January 2016 by Martina. Generalized or sweeping statements (especially if they’re extreme), about any segment of the population or subject, are often not based in data and facts. They are a tool used to underscore someone’s opinion. Engaging someone who only wishes to argue and prove their opinion is “right” is a waste of energy. Use your energy elsewhere to create positive change. Practicing discernment is part of self-care. Knowing when to engage is just as important as knowing how to engage. Taking pause before speaking allows you to assess how best to engage. Attacking someone based on their opinion or manner of speech is still an attack and proves worthless in the end. Using facts and data to rebut a generalized claim is a healthy approach. Everyone is entitled to his/her own opinion. Everyone is not entitled to spread lies based on their opinion. Knowing and understanding this difference is important. Practicing discernment and taking pause is a key component of healthy connection, both with others and with ourselves, especially in heightened emotionally-reactionary situations. Never underestimate the power of choice and the role it plays in the quality of your life. I was on Facebook, and a friend had shared a political article. It was about Muslims or refugees, the specific details don’t matter with what I am about to relate. In the comments to my friend’s post, a person (unknown to me) shared her opinion on Muslims in America. Actually, she shared her opinion on Muslims around the world. She made some sweeping generalized statements that are unverified, such as “none of them (the non-violent Muslims) are speaking out” about the violence and terrorism, “which means they condone the actions,” none of which were based in facts or research. Lately, with the escalation in hate-speech and fear-based language that I have seen bantered about so freely on the internet, I have chosen to disengage somewhat in order to preserve some measure of my own sanity. For me, it’s Self-Care 101: Be Discerning. My discernment meant being much more in control over my online presence, both in what I was posting, but also what I was reading. I recently had a conversation with a friend about this, actually. She had read the comments on a thread and became immediately disheartened with humanity. I can relate. So, I told her that I have done my best to only read those types of things when a) I am in a good emotional place and can practice discernment, and b) when I feel like I need to take a measurement of things. In other words, when I want to get a temperature of the emotional climate. In last week’s instance with regard to this woman’s extreme statements, I was in a good place, and it was a friend’s thread so I read the comments. Subsequently, I chose to respond. I did not attack the woman. Attacking serves no purpose, and it’s the fastest way to assure that your argument will not be heard. Nor did I attack her values and opinions – they’re hers. Who am I to judge? However, I did decide to correct her on facts, which I think was important. Where she made sweeping statements not based in fact, I offered data and examples. I shared how I located this information, and suggested that the blame for the lack of widespread knowledge of such (which she had placed elsewhere) resides more with the mainstream media, who seem to choose to focus on the sensational. We all have choice. Always. It’s one of the basic premises of what I teach. The power of choice directly impacts your life. One of the ways in which to strengthen the power of choice is by practicing discernment. As I said, at other times I have also chosen not to say anything in response to some inciting statements. I have discerned when I think it is appropriate, based on whether or not I can meaningfully contribute. (In other words, if someone just wants a fight, engaging them in that process is often a waste of energy.) I call it seed planting. That also means that I don’t have a specific expectation or investment in the outcome. My goal is to share truth where there are lies, hope where there is fear, and give it time to take root. If I am able to do that, I have done well. How we choose to engage matters. As I mentioned, if we are employing the same fear-based or emotionally reactionary tactics that we are responding to, then we are perpetuating the situation and potentially escalating it. This holds true whether it’s politics or personal relationships. Reacting from a place of shame, blame, or attack inevitably results in further breakdown. In this example, I was worried that I would end up in some back and forth with this woman, which caused me some distress until I reminded myself that I get to choose to engage or not. Discernment. In the end, she actually deleted her comments, which also deleted my reply. I can speculate about what that means, but I am choosing not to. My hope, however, is that I planted some seed of truth that will cause her to pause before making generalizations against any segment of humanity going forward. And that’s really what it’s all about, isn’t it? That we practice discernment, choose to take pause before we speak, and ask ourselves a simple question: Is this true? And if we can’t answer it with 100% certainty, I would hope that it would prompt more research, thought, and discussion. In this day and age of reactionary armchair politics and vicarious virtual reality, we have all but removed discernment and taking pause from our interactions. Yet, it’s this power duo that actually allows us to connect, not only with one another, but, perhaps more importantly, with ourselves.